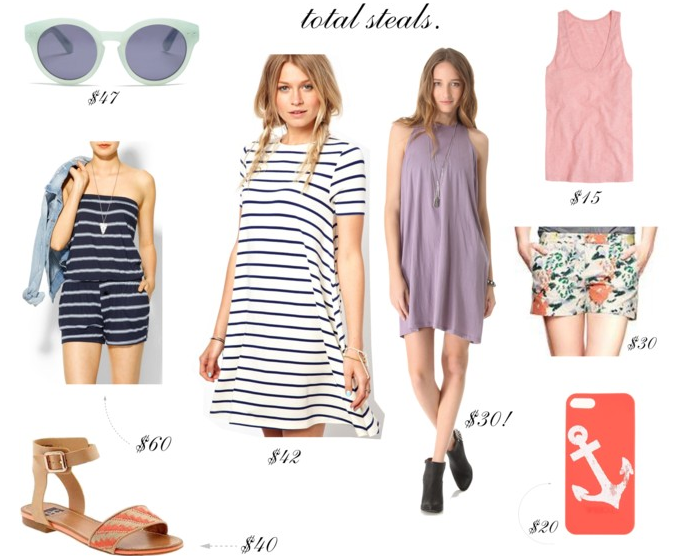 8 Summer Steals for Under (Wait for it…) $60! Hello again, Witty + Pretty peeps! When Ashley asked me to share a post on the ridiculous summer sales going on right now, it was a no brainer. There are so many summer pieces out there marked down to prices that would make your eyes pop out. I posted about these summer essentials for under $150, but I wanted to up my game a little and see what I could find for under $60. Let’s talk about ASOS. I mean, did you see Mary’s loot from the sale? Killer dress. I love this ASOS Swing Dress In Stripe. Stripes could not be more perfect for the summer and you could easily transition this dress into fall with a few key layers. Its also $42. Have you been thinking about rocking a romper all summer, but not into paying full-price? I could not agree more. Hello, Michael Stars Hampton Stripe Romper. Its $59, cute as can be, and could also be worn as a bathing suit cover-up. #MultitaskerNeed a few basics? Me too, which is why I already bought this J.Crew Vintage cotton tank in coral. Its lightweight and has the perfect amount of slouch. Tip: Go down one size–it runs large. The Cheap Monday Melinda Short Dress is a draped, jersey dress with oversized arm openings that would allow you to wear it in a million different ways. Wear as a cover-up or with a bandeau bra for an ultra cool + modern look. It comes in black, grey, and purple ash (my favorite). If you’re anything like me, you are already “adding to cart”. Enjoy all the guilt-free shopping and have an amazing week. Thanks again to my blogger BFF Ashley for having me over. Previous Post The Friday 5: Vacation!